The shortcut keyboard cover for Final Cut Pro X will instantly make your life easier. 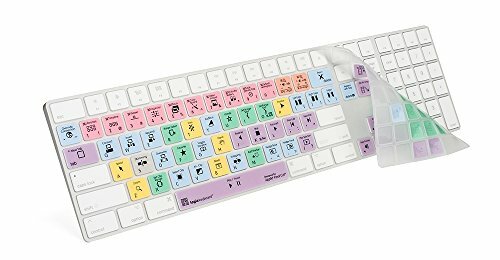 With over 80 keyboard shortcuts displayed this keyboard cover can speed up your editing by as much as 50 %. We sent the Apple Magic Numeric keyboard to a 3D rendering company who then came back with a flawless version of our new keyboard cover for Final Cut Pro X. Not only does this cover protect your apple keyboard, it also helps your editing life. Keyboard cover for Final Cut Pro X Apple Magic numeric keyboard. Hand washable- easy to keep clean, Helps muffle typing noises. If you have any questions about this product by Logickeyboard, contact us by completing and submitting the form below. If you are looking for a specif part number, please include it with your message.